Our boat bounced along the Gulf of Thailand as we sped toward the remote island of Koh Phangan. Like that scene in Jurassic park as the helicopter zooms toward Isla Nublar, an island with craggy cliffs, dense jungle, and idyllic coves of white sand loomed before us. The island is most known for its world famous Full Moon parties on the beach and as a backpackers destination. But Koh Phangan has a luxurious side too. We knew we were in for a real treat as we sped around the island to the northeast coast, where we’d be calling Anantara Rasananda home for a few days. We arrived with the speed boat pulling right up to the beach and we waded the last few feet in. Pristine. Secluded. That’s what ran through our minds as we got settled in to our villa tucked amongst the lush vegetation. It was immediately clear just why Koh Phangan featured prominently in Alex Garland’s 1996 novel The Beach. After a few days in Myanmar where we were covered in dust and sore from traveling by e-bike over terribly bumpy roads and sandy tracks, a glam getaway was just what needed to soothe our tired, aching bones. Our villa had all the comforts we’d need to never leave it: Apple tv that we could sign into our own Apple account on, mini bar with complimentary whiskey and vodkas re-stocked nightly, room service, and our very own private plunge pool. Faint strands of music and delicious scents lured us from our villa on our first night. With our toes in the sand we feasted on a beach barbecue of grilled lobster, tiger prawns, crab, calamari, and sea bass. Washed down with Thai beer for Tim and tropical cocktails served in coconuts for me, it was a perfect and relaxing evening. The crab eggs benedict is to die for! Breakfast each day was an indulgent affair. Anantara Rasananda’s breakfast buffet offered everything from a yogurt bar with all the fixings to fresh fruit to curries. My staple became the crab eggs benedict from the cook-to-order egg station. Sitting with my toes in the sand and watching the sea lap at the white sand beach while I savored the crab eggs benedict felt so incredibly luxurious. We spent the rest of our time on Koh Phangan in utter relaxation. We loved the Anantara Rasananda spa! The treatment rooms reminded us a bit of tree houses, each secluded and tucked above the lush jungle. Like magic, my last few aches were massaged away during my 90-minute Anantara Signature Massage. We even had a Thai cooking class in which we learned to make a delicious Thai green curry chicken and spicy prawn soup. Dicing, chopping and stirring might sound like work, but it was a lot of fun to learn to cook some of our favorite dishes. We didn’t spend all of our time at the resort, though you’d definitely not need to leave! There is a small village within easy walking distance from the resort and we wandered around trying delicious grilled fresh fish and chicken from open roadside kitchens. With all the food we’d eaten, we were glad to take an excursion to a beach on the other side of the island for a few hours of swimming and snorkeling. We had to work it off somehow and kicking our fins along the reef as we watched colorful fish was the perfect way to get some exercise. We were truly sad when we had to wade back to the boat that would carry us back to Koh Samui. 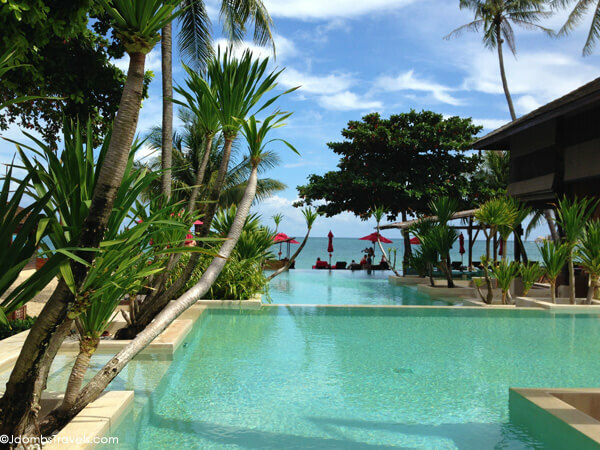 Anantara Rasananda and Koh Phangan was definitely one of our favorite stops on our two-week trip around Thailand. If we make it back to Thailand, this is one island we’d visit again in a heartbeat. After all, we didn’t make it to the waterfalls or Ang Thong Marine Park so there is certainly more for us to explore. The nearest airport to Koh Phangan is on Koh Samui. Flights from Bangkok to Koh Samui are hourly. Speed boat transfer is available or there is also the Songserm Express ferry from Koh Samui to Koh Phangan. Anantara Rasananda Koh Phangan has a variety of packages, including the Island Discovery Experience with speedboat transfer, buffet breakfast, and island discovery tour that we did. Rates start at 8975 THB (approximately $275 US) per night. A variety of activities can be arranged both at the resort and around the island. You can also book on our Booking.com partner site. Our stay was provided by Anantara Hotels & Resorts in order to bring you this story. However, Luxe Adventure Traveler maintains full editorial control of the content published on this site. As always, all thoughts, opinions, and enthusiasm for travel are entirely our own. This article contains affiliate links. When you book on Anantara or Booking.com through our affiliate sites, we earn a small commission at no additional cost to you. It just helps us keep things running here at Luxe Adventure Traveler! Does this place ever look fantastic on all levels – room, food, decor, activities… It would be hard to head back out on a bike onto dusty roads. There’s even hiking Leigh! We were supposed to go to a waterfall on our last day, but a storm had come in and it was too muddy to go. Definitely our favorite stop in Thailand! That looks amazing and the food looks out of this world. Yes, please!! I think you’ve been to Koh Phangan Val? This place looks amazing and the price seems very reasonable for all the amazing amenities. Filing this place away for our next trip to Thailand! You know, the price is extremely reasonable for a five star luxury resort! Definitely falls into the affordable luxury category. Can they ship me those crabs benedicts? Right? So delicious! It’s actually a really good thing I can’t have crab eggs benedict every morning. I’d need two seats on the plane before too long! I didn’t make it to Koh Phangan when I was in Thailand last, but it sure looks amazing! It was a very beautiful island! The seas were too rough to go out to the marine park, so if we get the chance we’d definitely like to go back. I wasn’t even aware there was an Anantara on koh phangan! I’m a frequent visitor to the one on Samui though. So will definitely check this one out too.